With Thanksgiving right around the corner, it’s time to think about which healthy sides are going to compliment the cozy, comfort food everyone will be enjoying. 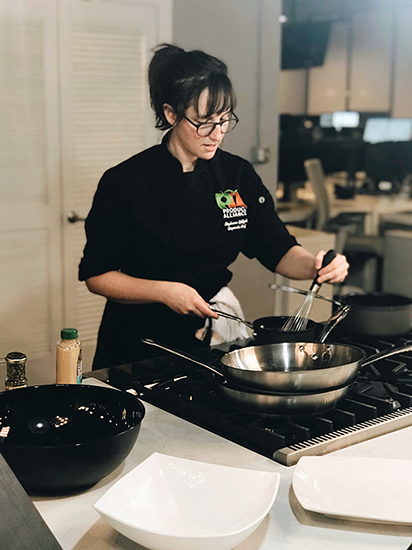 For PA’s Chef Steph, Brussels Sprouts are at the top of the must-add-to-the-menu list. See how she incorporates Southeast Asian-influenced flavors onto a heaping plate of roasted Brussels below. Heat the oven to 400 degrees F. Heat 2 tablespoons oil (or just enough to evenly coat the bottom of the pan) in 2 oven-safe wide skillets (12 to 14 inches) over medium heat. When the oil slides easily from side to side of the pan, add the brussels sprouts cut side down. When the cut faces of the sprouts begin to brown, transfer the pan to the oven to finish cooking, about 15 minutes. The sprouts are ready when they are tender but not soft, with nice, dark brown color. When ready to serve, divide the brussels sprouts among four bowls (or serve it all out of one big bowl), top with the dressing to taste and cilantro leaves, and toss once or twice to coat. Top with cashews. With the recent weather disruptions, the market has been a little unstable lately, and as a chef, that makes me want to return to the ingredients and flavors I know best. Pears are doing extremely well right now, and their subtle floral sweetness and adaptable texture can carry through into many cooking applications. They are delicious roasted alongside pork shoulder, onions, and marjoram, perhaps a splash of Calvados to de-glaze the pot. Before it gets too cold, try marinating lamb chops in diced, bruised pears, throwing them on the grill with fennel and topped with pear chutney. Pistachios and fresh shallots thrown in right at the end create a zingy pop of color and texture. And dessert, of course, cannot be missed. I love making a Tarte Tatin-inspired filling of deeply caramelized pears, brown butter, sugar, and a bit of brandy to use as a filling for crepes or poured over vanilla ice cream. Pears are also beautiful simply poached in cardamom and lime syrup, or with lots of red wine! Lastly, don’t be afraid to pair pears (see what I did there?) with bold flavors like stilton, walnuts, miso, and oinos. The sweetness can cut through just about any umami! I adore poached pears for Autumn desserts. You don’t have to turn the oven on, and they are so cool and crisp that they mimic the fresh, clean air around us this time of year. Plus, they can be made in advance and then simply adorned with vanilla ice cream. Just the kind of no-fuss offering we all need when we’d rather be playing outside in the leaves than slaving in the kitchen. Pears are a great choice for this dessert because they are floral and firm enough to hold their shape during poaching. Combine everything, save for the pears in a large, heavy saucepan. Add pears, and bring everything back up to a simmer. Reduce heat to medium-low and simmer slowly until pears are tender when pierced with knife, about 25 minutes. Transfer pears to a plate or platter. Boil liquid in saucepan until reduced to 3 cups, about 20 minutes for a luxurious sauce. Sometimes I also add a splash of balsamic vinegar to mine for an extra zing! Serve with vanilla ice cream. This crowd-pleaser is exactly the kind of sultry, comforting indulgence you want on a cold Autumn night. It's great for a crowd because everyone gets their own individual pumpkin, and each component can be made ahead of time. Preheat the oven to 400 degrees F. Cut your pumpkin in half or into fourths and reserve the pumpkin seeds for later. Place the pumpkin on a baking sheet and rub the pumpkin with 1 tablespoon olive oil and sprinkle with salt and pepper. Chop off the top portion of the garlic head to reveal cloves. Peel any excess paper/skin off from the bulb of garlic. Pour about a teaspoon of olive oil on top the garlic cloves and cover with foil. Roast both the pumpkin and garlic together on the same baking sheet for 45 minutes, or until the pumpkin is fork tender and the garlic golden brown and soft. Remove from the oven and allow everything to cool five minutes. Squeeze garlic out of the paper skin into a small bowl and mash well with a fork, set aside. Scoop your pumpkin out, removing all the cooked flesh, leaving the shells in-tact. Puree with 1 cup of the chicken broth, puree until completely smooth. To fry the pumpkin seeds. Add the reserved pumpkin seeds to a bowl and toss with 1 tablespoon coconut milk and 1 tablespoon flour. In a small bowl combine the chipotle chili powder, pepper and brown sugar. Place a skillet on the stove top and set to medium heat, add the olive oil. Once the oil is hot, add the pumpkin seeds into the pan, but be careful! Stir the pumpkin seeds around in the skillet with a spoon or spatula continuously until they expand and start to brown. Once the seeds are browned remove from the skillet and place on a paper towel to drain. Toss with the chili powder and a good pinch of salt. Taste and season accordingly. To assemble the soup, ladle the soup into bowls (or your roasted pumpkins) and top each bowl with a dollop of pesto, a sprinkle of pumpkin seeds and if desired drizzle with coconut milk. Fried bananas are a popular dessert and snack food in Thailand and throughout Southeast Asia. The dish is more often known as goreng pisang in Malaysia, Indonesia, Singapore, and surrounding countries. It's difficult to make fried bananas as good as those sold by street food vendors in Thailand and elsewhere. That said, this recipe is as close as it can get. It gets rave reviews from Thai and Singaporean taste testers. It can be served with coconut ice cream, but vanilla ice cream works too, or just enjoy them hot from the pan. Place oil to a depth of 3/4 to 1-inch into a small skillet or wok and heat. Meanwhile, prepare the bananas by peeling and slicing them in half. Then slice each section in half again, but lengthwise this time. In a medium mixing bowl, place all-purpose flour, 1/4 cup of rice flour, cornstarch, salt, and two tablespoons of the shredded coconut and stir to combine. In a measuring cup, mix together cold water with baking soda and pour into bowl with flour mixture. Add the egg and the vanilla. Stir well to create a smooth batter. Place remaining 1/3 cup rice flour in a separate, dry bowl and add remaining one tablespoon shredded coconut. Mix well and set next to the batter. Dip banana pieces first in the batter, then gently dredge them in the rice flour-coconut mixture. This last step helps firm up the batter and is the secret to creating a crisp (rather than soggy) coating. Your bananas are now ready for frying. Carefully place coated bananas in the hot oil. Fry approximately one minute per side, or until batter puffs up slightly and turns light to medium golden-brown. Remove from heat and drain on paper towel. Serve your fried bananas as soon as possible as is or with a side of coconut or vanilla ice cream on the side. For a fancier presentation, place them on a serving platter and sprinkle with confectioners' sugar. This dish is simplicity and elegance in one dish. Nothing beats ripe persimmons, except for when they have a slightly crunchy, sugary, caramelized exterior. This is a beautiful fall dessert that will make you wish persimmons were available in every season. Preheat oven to 400 degree. Cut persimmons in half horizontally (you can leave the skins on). Place cut-side-up in a baking dish. Combine cinnamon, ginger, star anise (if using), vanilla, honey, lemon zest and juice and boiling water in a bowl, then pour over persimmons. Cover with tinfoil and bake for about 45 minutes, or until persimmons are soft. Check on the persimmons halfway through cooking time and if they are looking dry you can top up with a little more liquid if needed. Switch oven to the broiler. 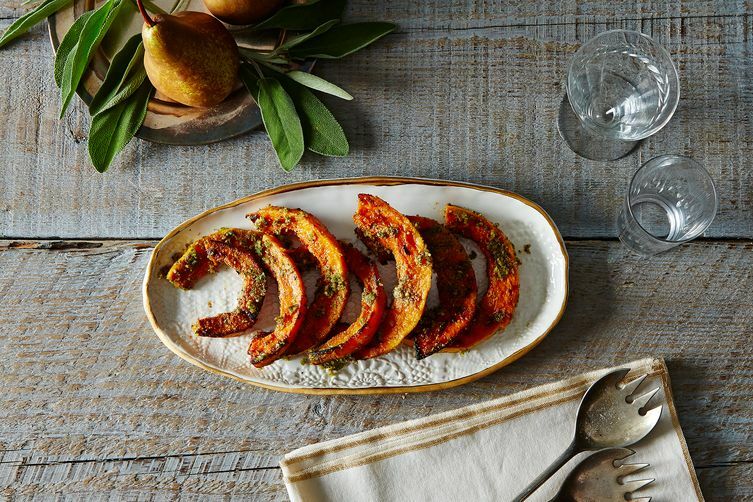 Remove tinfoil and spoon honey syrup over the top of the persimmons, then return to the oven to grill for 5-10 minutes or until the tops are caramelized and browned. Divide persimmons between serving plates and serve with a dollop of yoghurt, crème fraiche or scoop of ice-cream on the side. Drizzle over syrup from the baking dish, and serve with a wedge of lemon or lime to squeeze over just before eating. Ok, so it’s not a burger, but when treated correctly, cauliflower can be just as substantial. These sliders are fresh yet indulgent, and will please any crowd! Adjust the heat level as-desired, and if you are feeling generous, spring for the brioche buns instead. Arrange the cauliflower slices in a single layer on the prepared baking sheet and drizzle with olive oil. Season with salt, pepper, smoked paprika and thyme. Roast until the cauliflower is golden brown and tender, 17 to 20 minutes. Toast the buns in the same oven while the cauliflower roasts, and set aside. In a small bowl, whisk the yogurt with the Sriracha to combine. Open the slider buns and spread a layer of hummus on the bottom half of each bun. Top each with a piece of roasted cauliflower. Spread a layer of spicy yogurt on the top half of each bun and place ¼ cup sprouts on top of the yogurt. Close the buns and serve immediately. This recipe is a classic for a reason. Warm, satisfying, and soulful, it’s packed with flavor, color, and body. The addition of red wine vinegar plays so nicely with the natural sweetness of the bell pepper, and the heavy cream balances it all out. Roast bell peppers over a gas flame until they become charred, and remove their skin, seed and membranes. You can also roast them on a sheet tray in the oven at 450 degrees. Chop the roasted bell peppers in one inch pieces. In a soup pot add olive oil and add onions and garlic and saute until they become soft and translucent. Add fresh thyme sprig. Add the vegetable broth and bring the mixture to a boil. Add red wine vinegar to the soup for some acidity, and the cream for body. Taste the soup and make sure you like the salt levels. Add chili powder to taste. Serve hot with some crunchy bread.